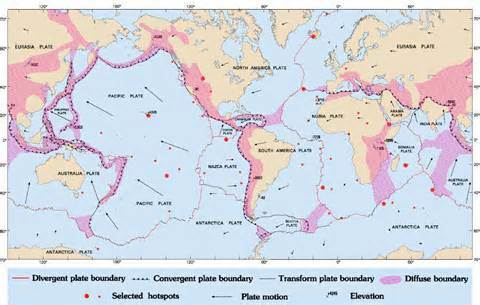 General objective of this article is to discuss on different Types of Plate Boundaries. Plates may converge directly or perhaps at an angle. Three kinds of convergent boundaries are recognized: continent‐continent, ocean‐continent, and ocean‐ocean. Here also discuss on Divergent restrictions. A divergent plate border is formed where tensional tectonic forces result in the crustal rocks being stretched and finally split apart, or rifted.